Burmilana #12 is a fine-spun embroidery thread available in wool/acrylic and cotton/acrylic blends. 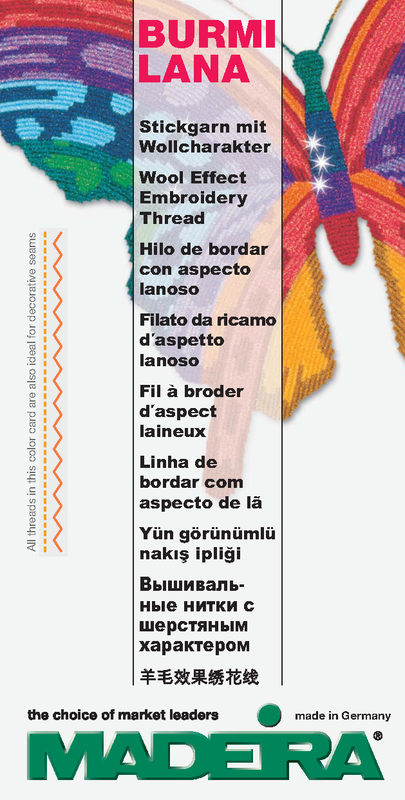 It provides a hand embroidered wool look when used with designs digitize specific for thick, 12 weight threads. Both Burmilana 12 wool blend & BurmilanaCo 12 cotton blend embroidery threads are perfect for high speed industrial embroidery machines. BURMILANA 12 weight is a wool blend embroidery thread. It is very soft and cool due to the high cotton content. A perfect alternative for a fresh and summery look. BURMILANA CO 12 weight is a cotton blend embroidery thread. It is very soft and cool due to the high cotton content. A perfect alternative for a fresh and summery look.